The Snowy Owl has a circumpolar distribution, with individuals making irregular migrations to the south in winter. MRF has begun to investigate the Snowy Owl as part of its northern raptors research program. 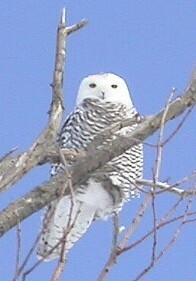 Snowy Owl roosting in a tree near Lake Ontario in winter.